What’s Included: 10 nights, daily breakfast and dinner, group transfer from and to the airport; English-speaking guide, bicycle rental, all entrance fees and our famous t-shirt. … hotel accommodations rather than barge for this trip in the heart of Europe, where you move from country to country the way we move from state to state at home. If you like the added dimension of staying in a small hotel in the midst of a town rather than the undeniably convenient but somewhat removed accommodation of a barge, then this tour is for you. Your luggage, of course, is transported by us. 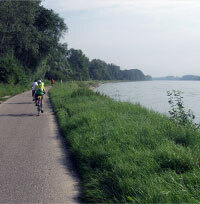 You will fly into Switzerland and transfer by coach to Germany, to Neuenburg am Rhein, in bike tour country. 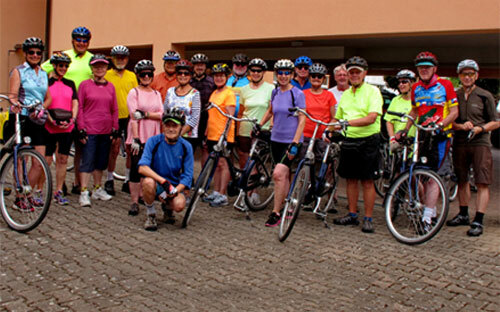 First order of business: try your assigned bicycle, make note of the local rules of the road and the IBT corner system, and generally get set for the biking to come. 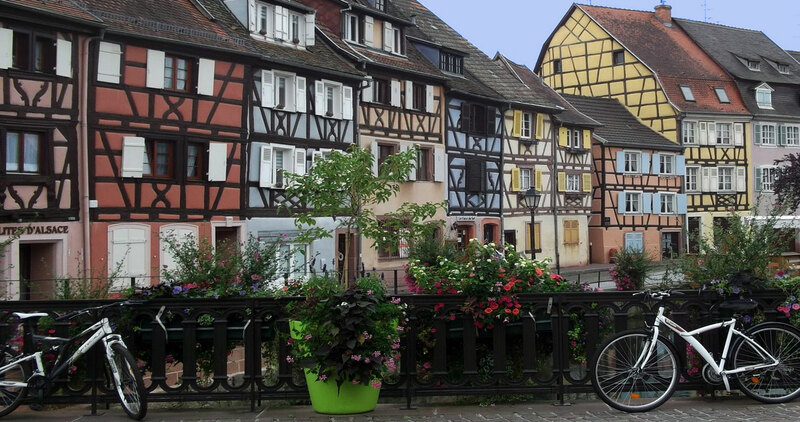 The next day we’ll bicycle into France, just across the Rhine, and proceed to Colmar where we’ll spend two nights – a fine town in which to have some extra time. Colmar escaped the wholesale destruction of the world wars and is a splendid place for wandering. Medieval and Renaissance buildings are enhanced by 19th century monuments and fountains and in the Dominican Church is the touching Virgin in a Rose Garden, by a 15th-century local artist, Martin Schongauer. Colmar’s Unterlinden Museum houses the famous Isenheim Altarpiece, an early 16th-century work combining sculpture and painting. Our next night is in Selestat, where we visit a 12th-century chateau, Haut-Koenigsbourg. We are in the Alsace section of France, historically linked to Germany, in an area where both countries take pride in their local foods and where Alsatian wines come from. A visit by coach to a wine cellar will expand your knowledge on that front and you may also want to become knowledgeable about many-flavored macaroons, another specialty of the area. 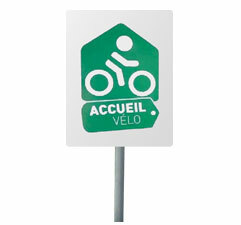 Fortunately, you are biking, as still another of our visits is to a chocolate museum where tastings are featured. Two nights in Strasbourg will allow for a guided tour of this town with its long memory and handsome buildings, plus time to explore on your own. Like the natives, you can enjoy a cafe terrace view of the passing scene. We continue along the river to Seltz, a small French river town.